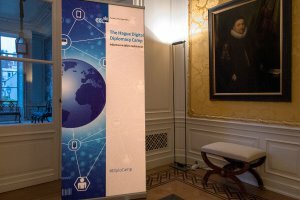 The Global Diplomacy Lab had the honor of closely collaborating in The Hague Digital Diplomacy Camp “Influence and Diplomacy in a Diffuse Digital World” in the Netherlands. It took place on 1 and 2 February 2018 and brought together various institutional networks of global diplomacy. 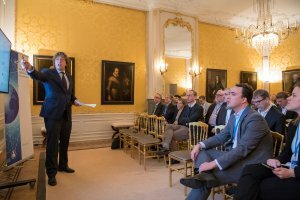 As the Ministry of Foreign Affairs of the Netherlands hosted the event, its Minister Halbe Zijstra delivered a keynote speech. Therein, he put emphasis on international and inter-institutional cooperation: “When governments and networks join forces towards a common goal, wonderful things can happen”. The Camp followed an unconference format and served as a platform for exchanging knowledge and ideas on digital public diplomacy, discussing the effects of digitization on international affairs, as well as sharing practical tools and designing solutions for global challenges such as the SDGs, humanitarian aid and climate change. 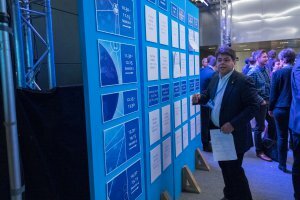 At the conference, there were several data scientists, tech-driven NGOs, leading PR and communications professionals, journalists and civil-society activists. 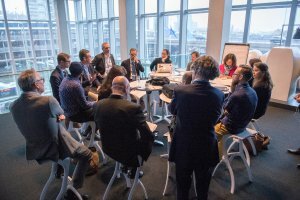 GDL Members Blair Glencorse, János Kóka and Diego Osorio led an interactive session on “Hacking SDG 16: Using Digital Diplomacy to Support Accountability and the Rule of Law”. Other questions that automatically arose read as follows: What do governance and the rule of law have to do with the SDGs? Can we combine online and offline efforts to improve development? The idea was to find creative ways for diplomatic actors to build sustainable, context-specific and collective efforts for good governance and the rule of law using technology. The panellists engaged in a lively discussion (in true digital diplomacy style!) via a teleconference connecting the Dutch embassies in Bogota, Abuja and the Ministry of Foreign Affairs in The Hague. Highlights included an analysis of the digital tools that can help overcome the challenges facing global development, from the delivery of public services to the environment to public finance, as well as an in-depth debate about ways in which to promote accountability and the rule of law. Glencorse commented the lack of infrastructure and digital expertise in many areas as follows: “There are many parts of the world that are still not as well connected as they could be, so making sure that digital tools are matched with offline and traditional tools is part of a coherent strategy.” An example he mentioned are the Daily Talk billboards in Liberia thanks to which citizens are able to discuss issues, essentially using the billboards as a kind of “offline Twitter”. Unfortunately, “too often digital diplomacy is carried out in silos, without the relevant actors speaking to each other. Governments are one actor in this space, but it is actually corporations and civil society that often have greater space/engagement in the digital realm”, Glencourse pointed out. As an example, Van Eijk mentioned the shockingly high number of human rights defenders killed in Colombia every year by armed groups. He touched on the Human Rights Defenders initiative, via which ambassadors are organising high-profile field visits to regions where human rights activists are under threat, to understand what’s going on, to show solidarity and draw attention to their plight. The ambassadors use Twitter and other social media to report on these visits, to make the voices of those under threat heard, to support the cause of these human rights defenders. They also reach out to traditional and non-traditional media to draw the attention of the political class to the situation. Van Eijk further mentioned that the attention these human rights defenders gain from social media exposure also affords them a certain level of security. Due to rising activity in social networks, every person is an unofficial spokesperson for the organisation to which he or she is affiliated. This mixture of the public and private sphere adds complexity to current jumbles and diffusions. 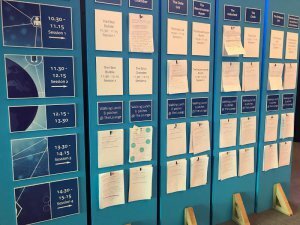 At the unconference, participants from government, tech and civil society discussed different challenges that emerge from digital innovations but also how diplomats can use digital innovations to leverage their work. 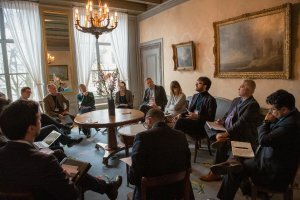 Under the slogan “Talk, listen, and create”, participants held sessions themselves and discussed how to apply diplomatic tools to tackle current challenges. 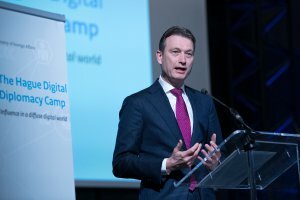 The Camp contributed to breaking down barriers, learning about new technologies and gaining fresh motivation for an engagement in a transformative future of international digital diplomacy.